A team of computer scientists at Worcester Polytechnic Institute (WPI) has received a two-year, $347,000 award from the National Institutes of Health to develop and evaluate new computational techniques that will provide a better understanding of the genetic and molecular interactions that underpin complex diseases. For example, the tools will help predict the likelihood that specific genetic mutations or patterns of mutations will lead to diabetes, neurological disorders, cancer, and other maladies; the likely outcome of those diseases; and how well those conditions will respond to treatment. Led by Dmitry Korkin, associate professor of computer science and director of WPI’s Bioinformatics and Computational Biology Program, the team will develop tools for sifting through the vast amount of data now being produced by next-generation sequencing techniques about genetic mutations linked to various diseases, as well as the alternative gene products that occur in diseased tissues, to develop a deeper understanding of the complex interactions of genes, RNA molecules, and proteins within cells that ultimately shape the inception and progress of diseases. Korkin says existing big data tools are limited in their ability to model complex biological networks and how they change in a disease state. And while the hope is that such tools could one day replace laboratory experiments, or at least help scientists determine which experiments are likely to yield the most useful results, they are not yet up to that task. With the NIH award, Korkin said he hopes to bridge that gap by developing new kinds of computational methods that draw on an area of artificial intelligence known as machine learning. He said the goal is to better model the complex web of molecular interactions within cells that begins when genes, which contain the genetic code for making proteins, are transcribed into RNA molecules. RNA, in turn, transfers the genetic information to machinery within the cell that uses it to assemble specific proteins. Finally, the myriad proteins produced within the cell interact in an intricate molecular ballet. 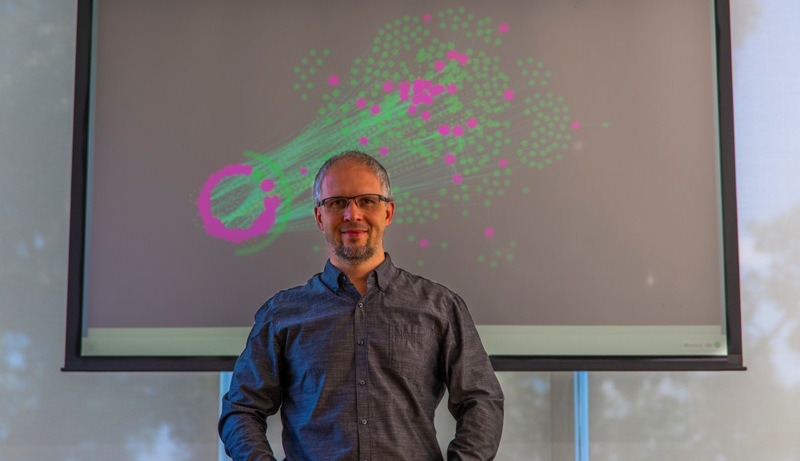 In particular, Korkin said his aim is to create algorithms that can predict how this dense web of interactions changes when the genes develop mutations. These insights could help lay the foundation for personalized medicine, in which physicians will have the tools to predict the likely course of a particular disease in individual patients and prescribe individualized treatments. Korkin says the computational tools his group will develop with the new NIH award will also be able to account for the effects of alternative splicing, and the knowledge gained with those tools could advance our understanding of biology and improve healthcare. For example, he said it is believed that some genes produce different proteins in different tissues, at different times of day, or under different environmental stressors. It is also believed that the genes in tumors may express different proteins at different pathological stages. Having a tool that can predict these alterations could significantly enhance how diseases are diagnosed and how new treatments are developed and administered, he said. In a recent paper in the journal RNA (“Biological classification with RNA-Seq data: Can alternative spliced transcript expression enhance machine learning classifier?”), Korkin and his colleagues tested whether machine learning tools that use data about alternative splicing perform better than tools that rely on data about gene expression (or data about how the genetic code is translated into proteins). In the paper, the challenge presented to the algorithms was to take molecular data about tissue samples and identify the tissue types, the age and gender of the individuals from which samples were taken, whether the tissues were healthy or cancerous, and the pathological stages of individual tumors. They found that in virtually every case, the alternative splicing data was better at classifying the samples than genetic sequencing data, and that in many cases it produced classifications with 100 percent accuracy. “Whether we looked at tissue-specific effects, developmental changes, or disease stage data, everything was classified with greater accuracy by using the alternative splicing data,” Korkin said.